Summer came in with a rush over the past several days. Clear skies and heat! The poppies are nearing their first flush of blooms and what a run they've had. Bloom after bloom. I think I love the seed pods almost as much as the flowers themselves. I poke them into flower arrangements for a bit of architectural interest. Strawberries and thyme. I was talking with my younger daughter one day, via Skype, and she said she was making Honey Thyme Strawberry Jam. It sounded delicious, and there were another couple of pounds of strawberries just picked, so I made a batch. It's from Marisa McClellan who writes a blog and books about small-batch canning. The thyme flavour is very subtle, and I wonder if I didn't add enough. Perhaps the flavour will intensify over time. My reading stack. I've finished the bottom three and enjoyed them. Today, after the family left in mid-afternoon, I took Winter Garden out to the patio and read, lounging in the shade. Utter luxury. Today is Father's Day in Canada, and in many other places in the world. I have been so blessed with wonderful fathers in my life. My own father is in the photo above, taken in 1945, in Saskatchewan. He's the eldest of the four brothers, the tallest lad in the photo. He's been a steady and loving presence in my life and I am so thankful for him. I'm also blessed with a husband who is a great father, and a son and son-in-law who have learned from their fathers to love and guide their children. After a large midday meal with the family, beginning with appetizer tarts and continuing on to grilled ribs and a variety of salads followed by dessert, something simple appealed for supper. I went through my recipe cards this week looking for a recipe and came across this recipe for a Brie and Apple Salad. I threw in some fresh strawberries. The dressing is cream, mustard, a bit of maple syrup and white vinegar. Different and very good. Just two more days of classes, then reports and clean up. Graduation is on the 28th, which is the official end of the school year here. Someone asked about when we begin classes - that's the first Tuesday after Labour Day, so, the first week of September. The schedule differs a little from province to province. I'm looking forward to getting out in my garden more - the weeds are taking over the vegetables, and spending time with grandchildren, taking a little vacation, and hopefully lots of reading and lounging about. Nice colorful shots! Enjoy your summer! I like the sound of the strawberry preserves and the salad look s very appetising. I've made a note of the titles in your book stack and will be checking them out on amazon soon. I'm still not receiving email notification of comments left on my posts are you? The light supper sounds delicious. Your head must be full of plans for the summer...things that must be done and fun to be had. So, have you been tasting the water as it boils? I have and am beginning to get the hang of it. I like the idea of thyme and strawberry. The apple,brie and strawberry salad is something I must try - thanks for sharing the recipe. The salad with Brie looks delicious! I must read the Winter Garden as I enjoy Kristin Hannah’s books. Am always looking for good book suggestions, thank you. Your jam sounds wonderful too! The salad looks delicious! And a wonderful stack of books. Our kids have been out of school for almost a month---but they go back in the middle of August. I love your idea of using the poppy seed heads in flower arrangements! Refreshing photos. Love the old one with your father, too. Happy end of school year to you! It sounds like you have the right idea about your summer vacation....time to do things you want to do without a tight schedule. I've read The Winter Garden and enjoyed it, I'll look for the other books in your stack. Enjoy your afternoon! With your busy schedule, I am impressed that you have managed three books … and jam, come to think of it! 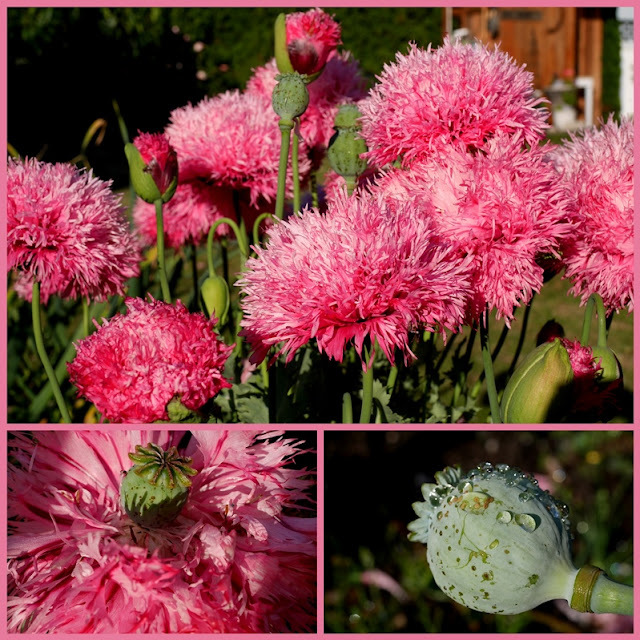 Your poppy pictures have reminded me that I need to visit our local garden center to buy wildflower seed for sowing later in the summer … a friend advised me that wildflower seed from the big box stores inevitably contains plants that are considered noxious weeds in Montana - and I have enough of those already!!! Enjoy the rest of your week - the best of summer awaits! You summer flowers are as bright and cheery, as is the thought of a relaxing read outside with a thoroughly good book! That is my sort of salad! Happy days. my goodness the jam and the salad sound and look delicious. I think I need to save the salad for summer when it arrives. I've enjoyed this little look into your world. Enjoy the school holidays! What do parents do with their children for 2 months?? I was blessed with a wonderful father, a wonderful husband and now a wonderful son who is a wonderful father. Have a great week and thank you for stopping by my blog this week. The combination of thyme and strawberry is interesting. The salad looks so delicious and visually appealing color-wise and for the look of simplicity. School year ends in March in Japan. Three of my grandchildren are having a one and half months summer break. I can’t be so active like you during the summer which makes me lethargic due to high humidity and heat, but look forward to spending with my little ones for sure. I love to eat strawberries. Get attracted with the bright red color. I love seeing old family photos. That's a great one of your dad. Homemade jam is something I've never made. Congrats on getting nearer to the end of the school year. Thank you - I'm always looking for simple salads that are a bit different! I'm intrigued by the honey thyme strawberry jam and the cream dressing for your salad. I maintain a social media account for work so I've been reading books about writing to learn how to write more engaging tweets and FB posts. Beautiful photos, Lorrie! I always admire your enticing food photography. The poppy seed pods are indeed very pretty and cute. Your summer plan sounds perfect! The salad looks delicious.Spring left with a vengeance: hail and tornados here in Colorado. We had hail; no funnel clouds. Enjoy those strawberries; i imagine they are sweet and juicy. Good Morning Lorrie, what a lovely post. I was just thinking about my father last night while saying my prayers. He was a great dad and he raised me to know and put my faith in Jesus. He died when I was 15 and it totally broke my heart, but I remember him and think of him often. It's not about the length of time you have with a loved one but the quality of time you have with them. Here's wishing you a relaxed and enjoyable summer . . . lots of gardening, reading and doing the things you love. Thank you for being such a sweet blogging sister. Such an enjoyable post to read Lorrie. 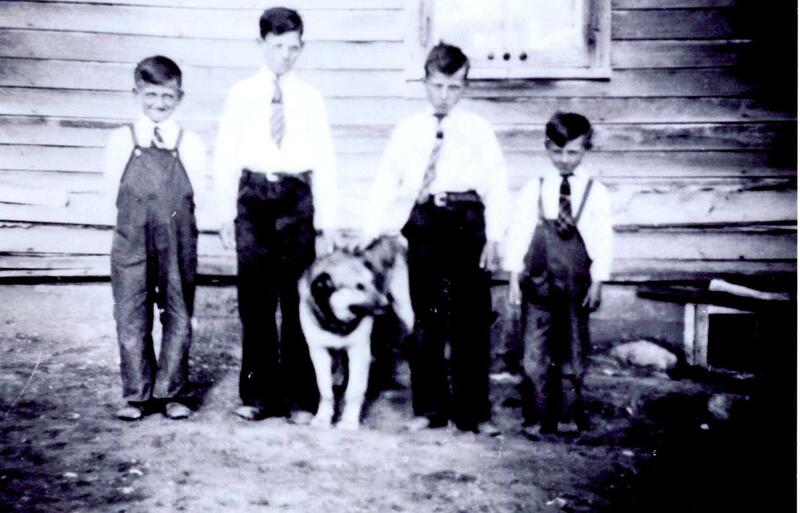 The old photo of your dad and his brothers is great - how times have changed since the 'good old days' of growing up! Beautiful pic’s. By now your classes are done for the year...and you will be wrapping things up. Enjoy your summer...the books, the grands, and the garden! Oh my, that brie and apple salad with a few extra strawberries looks and sounds delicious. Your coming summer break plans sound very good! Your new blog look is so pretty! I want to try the brie and apple salad dressing. It sounds good. Happy Summer days to you!